Karl McNerney, Deirbhile and Brianna McCaffrey practicing for the show. 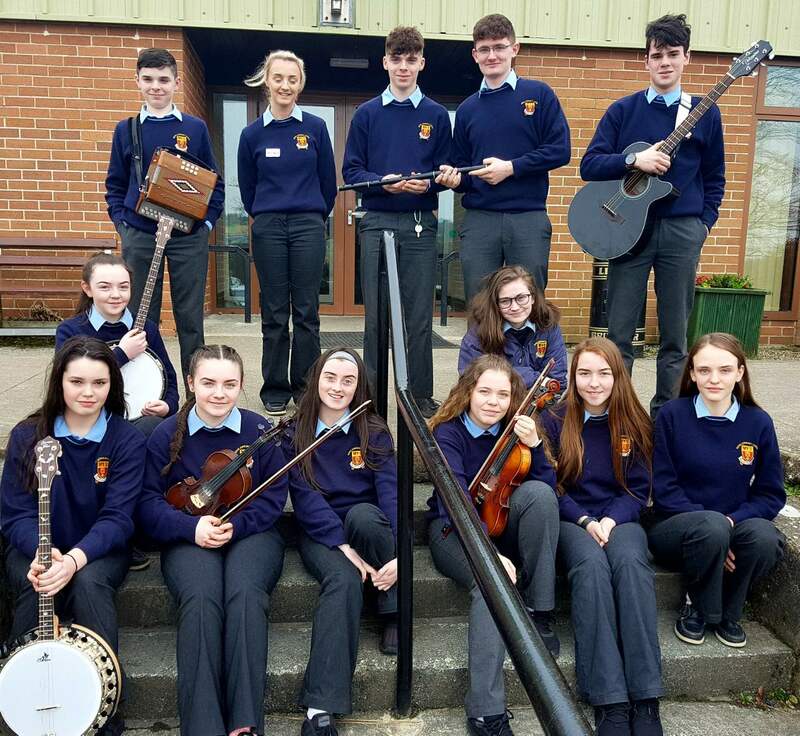 Below: the Moyne CS Trad Group ready to play a few tunes. Remember the 80s? Do you recall 'Dirty Dancing', 'Flashdance', 'Raging Bull' and 'St Elmo’s Fire'? Perhaps you idolised Demi Moore, Keanu Reeves, Kevin Bacon, Patrick Swayze or River Phoenix? The students of Moyne Community School want to transport you back in time to this era where big hair was a must and nobody “left baby in the corner”. The place to be on April 25, 26 and 27 is The Latin School in Moyne where Moyne Goes Back To The 80s. The Transition Year students, along with their Drama teacher Trish Murren and the Music Department came up with the idea of a major show back in September and this April will see the fruits of their work. “Planning is key. Myself and the TY class spent a lot of the initial stages working on possible acts that would capture the 80s,” said Trish Murren. The students couldn’t believe how many songs they actually knew when they started to research the 80s. Auditions were held in January and the response was amazing. Most years are represented in the show, from first year to sixth. The show will open with African 80s music, which in itself is a spectacular array of percussion, music, song and dance. What follows is a variety of covers from artists like Bruce Springsteen, Prince and Michael Jackson to mention a few. Some students opted to form groups that reflected certain music genres. For instance, there will be a Girl Power act featuring the music of Whitney Houston, Madonna and Cyndi Lauper. Apparently, Freddie Mercury – or someone who looks a lot like him – will try to “break free” on the night! Moyne boasts a fantastic trad group and they have put together their own compilation of music from that era also. No show from the 80s would be complete without touching on the musicals. The students decided to bring the music of Abba to the stage and they have been working so hard on their own Mama Mia set. A special word of thanks goes to Amber Sullivan and Aibhe Flynn from TY who helped choreograph this particular act! Preparing for the show has been an exciting journey for the students and teachers of Moyne Community School. The TY Art and Craft class will transform the beautifully intimate and quaint venue into a scene from the 80s. The stage is set and the best is yet to come. MC on each night is Myles Reilly and rumour has it that a local group of 'Brave' lads might drop in too! Everyone should be given the opportunity to take part in a production or show in their lifetime. It creates confidence, it fosters friendship and it makes memories that will last forever! Tickets are now on sale in Moyne Stores, Corrigans, Mitchells Butchers Drumlish, Lynch’s of Arvagh and Moyne Community School.